When a historic building is the setting of a new restaurant, it goes without saying that it's best for the current tenant to pay its respects to the past. 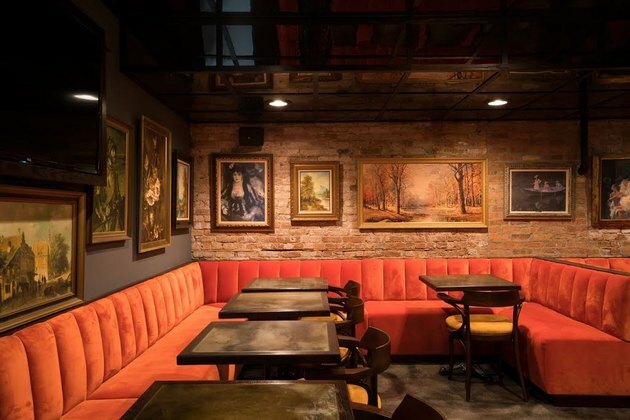 Chicago's Willow Room, which is set inside a landmark in the Lincoln Park neighborhood, is part of that unspoken rule. 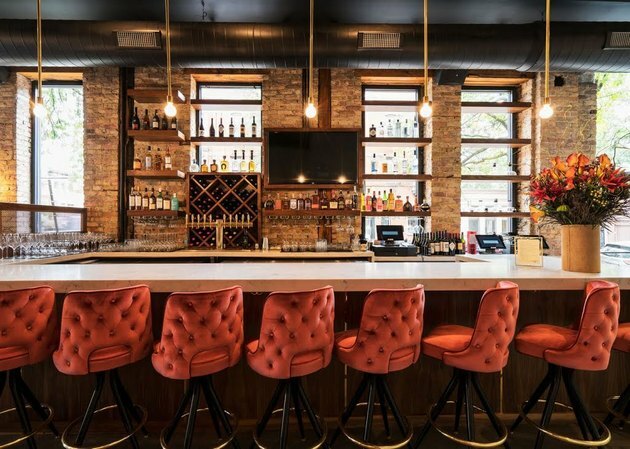 The site was once the home of Schulien's Tavern, one of the few taverns that remained open in defiance of prohibition, and so Nicole Alexander of Siren Betty Design rightfully aspired to "play off the integrity of the building," she said. 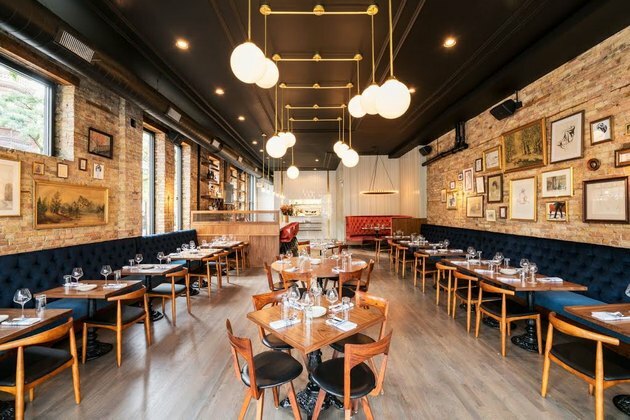 The space opens into a main dining room with large windows and a stained red oak floor, where brass fixtures contrast honey brick walls dotted with found and original art. And down a narrow flight of stairs, an underground lounge lined with plush velvet booths surrounds a low bar and a stocked wine cellar. It's just the type of scene that would fit in perfectly with yesteryear, although chef Marissa Janz's modern take on classic American eats still ensures that today's guests leave satisfied. 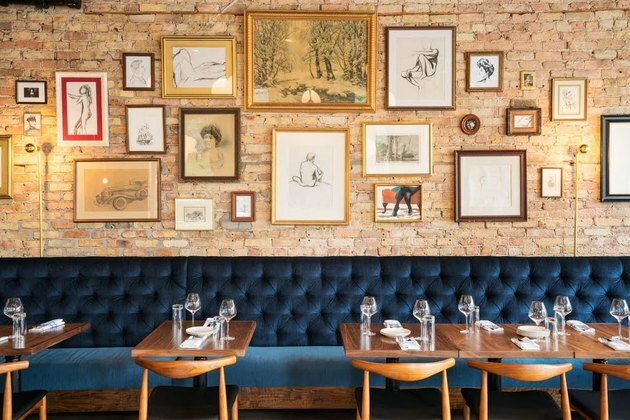 With long bench seating upholstered in deep sapphire next to walnut tables by VERO Design + Build, the main dining room is dramatically elegant. Siren Betty Design custom made the lighting. "The building has classic Chicago architectural detailing, so we wanted to make sure we highlighted those elements," said Alexander. Found pieces and original drawings by the firm's artist Susan Williams hang on the walls. The bar has an "Ella" marble counter top from Cambria and plush red chairs custom made by Richardson Seating. The hanging light bulb fixtures were created by Siren Betty Design. 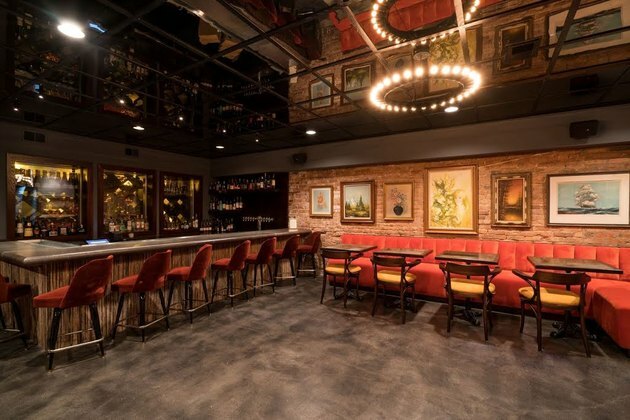 Warm lighting, brass, and plush seating offset the rough brick walls, which Alexander wanted to "soften" with details. Red oak flooring was stained grey in the lounge, and a wine cellar behind the bar acts as storage and decoration. Reyna Abraham is a Freelance Writer, Editor and Educator who studied English Literature and Language at California Polytechnic University California. Her work has been published online at Downtown Magazine New York, eHow, and Hunker. She works as a writing consultant for the Architecture firm Gregg Maedo & Associates and has an appreciation for the ways that human ingenuity, design, and thoughtful engineering intersect. This Mar Vista Restaurant Reflects Old and New L.A.